The following diagram shows how to solve multi-step equations. Scroll down the page for more examples and solutions. Consider the equation 2(x + 1) – x = 5. First, we will use the distributive property to remove the parenthesis and then we can combine like terms and then isolate the variable. 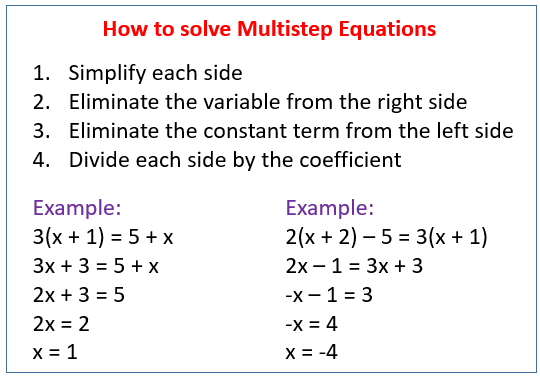 How to solve multi-step equations by combining like terms and using the distributive property? 3. Lydia inherited a sum of money. She split it into five equal chunks. She invested three parts of the money in a high interest bank account which added 10% to the value. She placed the rest of her inheritance plus $500 in the stock market but lost 20% on that money. If the two accounts end up exactly the same amount of money in them, how much did she inherit? To solve an equation with fractions, we first try to change it into an equation without fractions. Then, we can solve it using the methods we already know. Consider the equation . To remove the fractions, we would need to multiply each term of the equation with the LCM of the denominator. In this case, we will multiply each term with 4. The 4 will cancel and we are left with equation 2x – 12 = 3. To isolate the variable, we will add 12 to both sides and then divide by 2. How to solve multi-step equations with fractions? How to solve Multi-Step Equations with Fractions & Decimals? The steps involved in solving multi-step equations with decimals are the same as those in equations with whole numbers. The complication may lie more in the multiplication and division of decimals rather than the steps. Another method would be to multiply each term of the equation by ten (or hundred) to convert the decimals to whole numbers and then solve the equation. How to solve multi-step equations with decimals? How to solve multiple step linear equations involving decimals? 2. Add or subtract, as needed, to get all variable terms on one side and all constant terms on the other. Then combine like terms.